SAILKARMA.COM - Sailing News, Videos and Photos! : Onward to the front! Blue boat and white track is from 2007 record. Green is there position today. 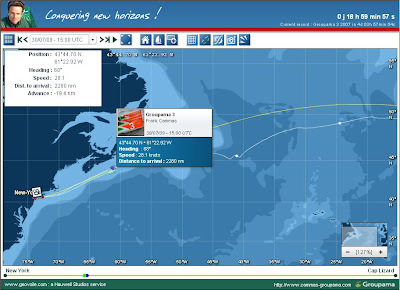 Franck Cammas was in fine fettle this Thursday noon for the first radio link-up organised with the shore-based HQ in Lorient, at which point the green trimaran had already covered over 450 miles since setting out from New York on Wednesday at 20h 12' 16'' UT. "We're sailing downwind on flat seas with 20 to 25 knots of breeze. We've had to make a few sail changes since leaving the Ambrose Light, hoisting more sail aloft this morning as we set the gennaker. We're trying to go fast by heading up to accelerate. The crew is well aware of the score during such record attempts and the conditions aren't overly difficult: we've been able to rest whilst maintaining a high average speed. Our watch system is in place at the moment (0930 hours UT) Fred Le Peutrec, Lionel Lemonchois and Ronan Le Goff are on deck; Steve Ravussin, Bernard Stamm and Olivier Mainguy are on stand-by; myself, Loïc Le Mignon and Bruno Jeanjean are resting. As for Stan Honey, he is off-watch so he can take up position at the chart table and help us on deck during manoeuvres.